Jadon Sancho (l.) has travelled to Augbsurg, but Mario Götze (r.) has not. For the first time since his summer move, Jadon Sancho is with the Borussia Dortmund first-team for a Bundesliga weekend, as Peter Bosz and his team travel to Augsburg. The England U17 international has featured three times for Dortmund’s second team and U19 teams, but is now in line to make his full professional debut and will, in doing so, become the club's first ever English player. He impressed during Dortmund’s 5-3 UEFA Youth League thumping of Real Madrid before Bosz’s team lost 1-3 in the main event on Tuesday night and has been training with the first-team squad since joining from English Premier League side Manchester City. Watch: Jadon Sancho provides the best bits from himself vs. Real Madrid on his Instagram! 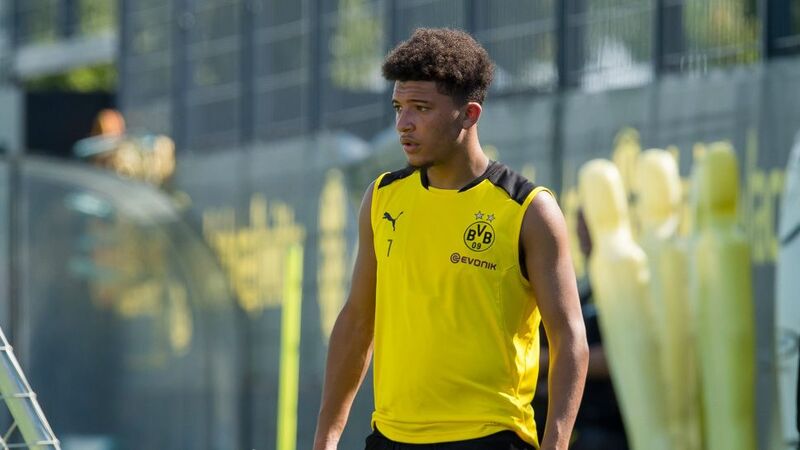 Although he may make his debut on Saturday, Sancho will be unavailable for Dortmund through the month of October as he has been selected in the England U17 squad for the World Cup in India. The tournament begins runs between 6-28 October. Dortmund’s game in Augsburg (kick-off: 15:30CEST/13:30GMT) on Saturday, and you can follow the build-up, match action and reaction here.